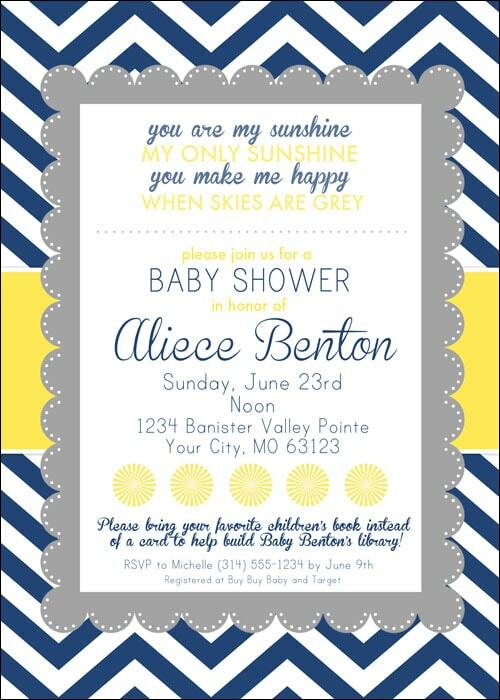 Recently I helped design some baby shower printables for my sister’s friend who is expecting in a couple weeks. 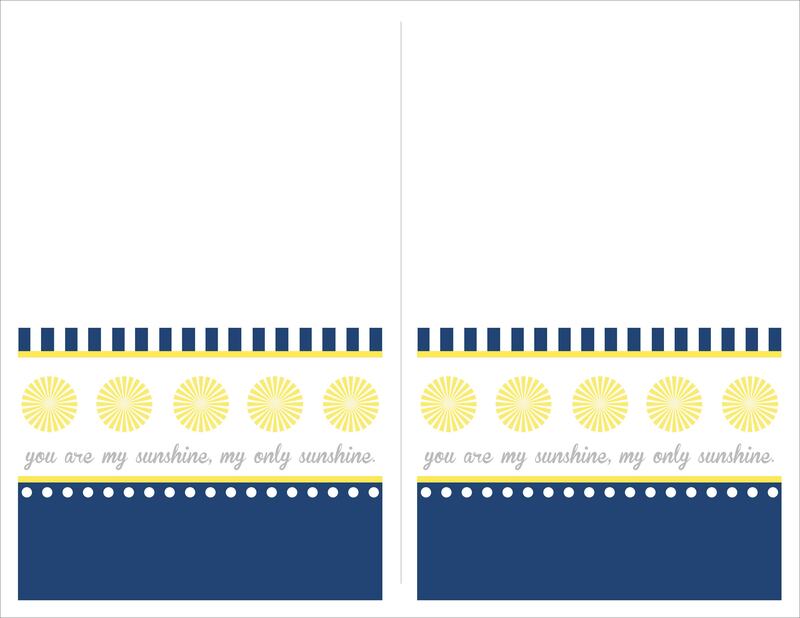 Since she doesn’t know the gender, we decided to run with a “You are My Sunshine” theme in navy blue and yellow (pretty gender neutral). 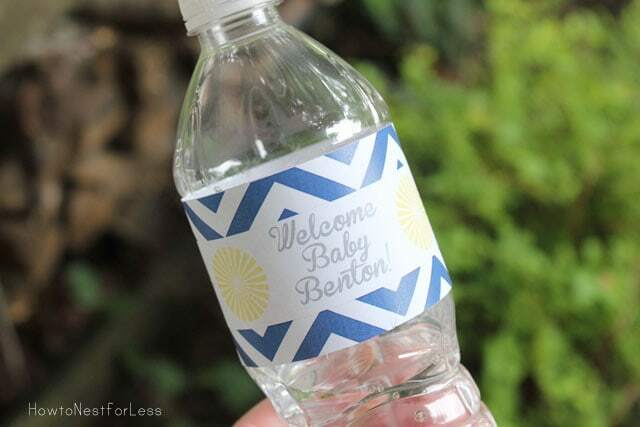 Included is an invitation, food cards, cupcake toppers/favor tags, and water bottle labels. Hope you enjoy! Above you can see what I sent to print for the invitation: a 5×7 one-sided card. 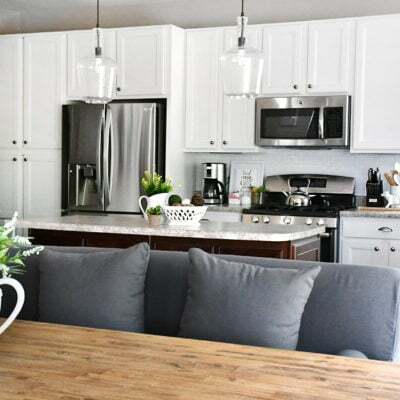 Below is a blank version that you can revise in PicMonkey, Photoshop or even Paint. I would suggest printing on cardstock and inserting into blank envelopes (I purchased mine from Target & WalMart in the past). Fonts used are Brannboll, Futura, and Print Clearly. 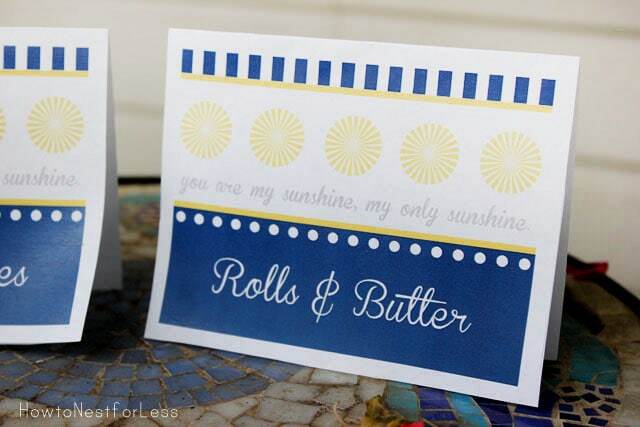 Food cards are a great idea for your party, especially if you have guests with allergies. The printable leaves the bottom blank so you can customize to your menu. Just edit in Photoshop, PicMonkey or even add text in Microsoft Word once you place this file inside a blank document. Then print and fold in half! 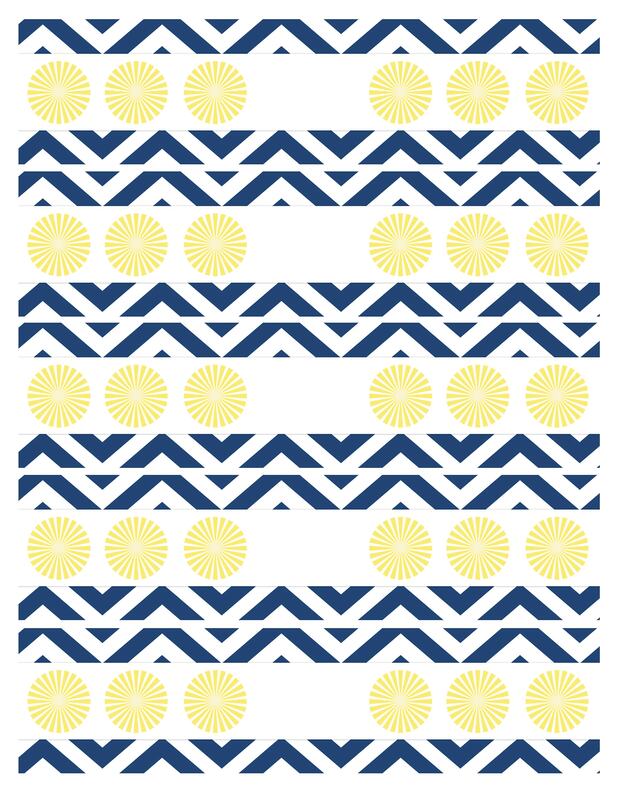 Just add any text you want into the middle of the design. I used the font Brannboll. 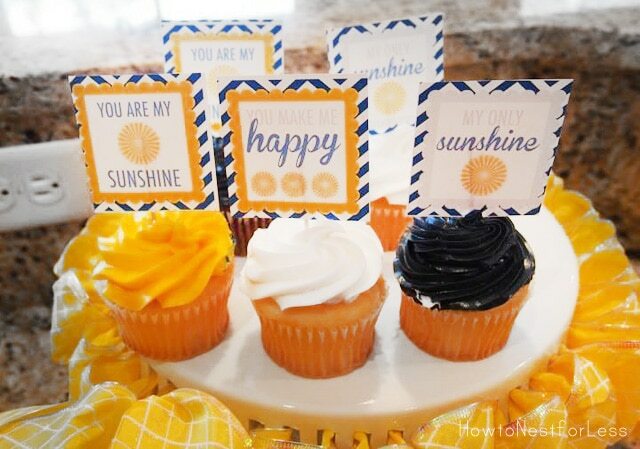 How about some adorable cupcake toppers? Just print, trim out, tape to toothpick and insert into the top of a cupcake. 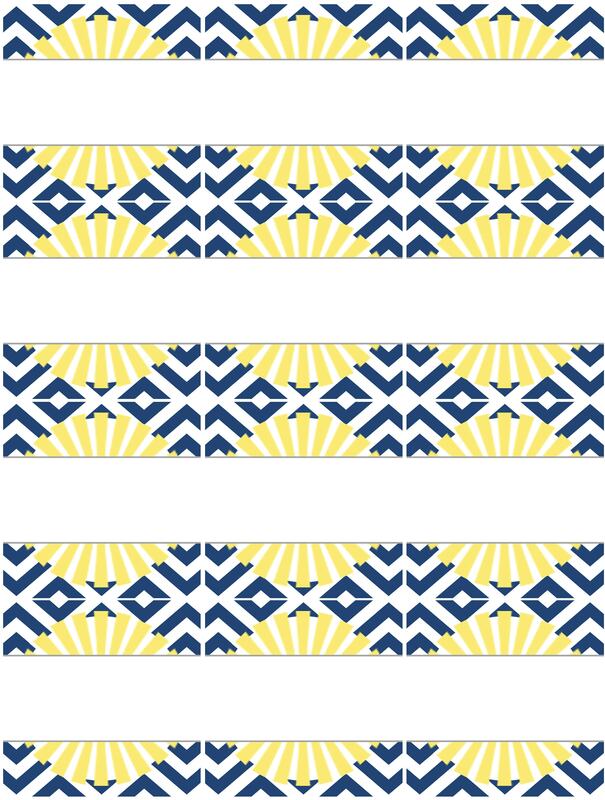 Or you can use these as favor tags on cute little goodie bags. 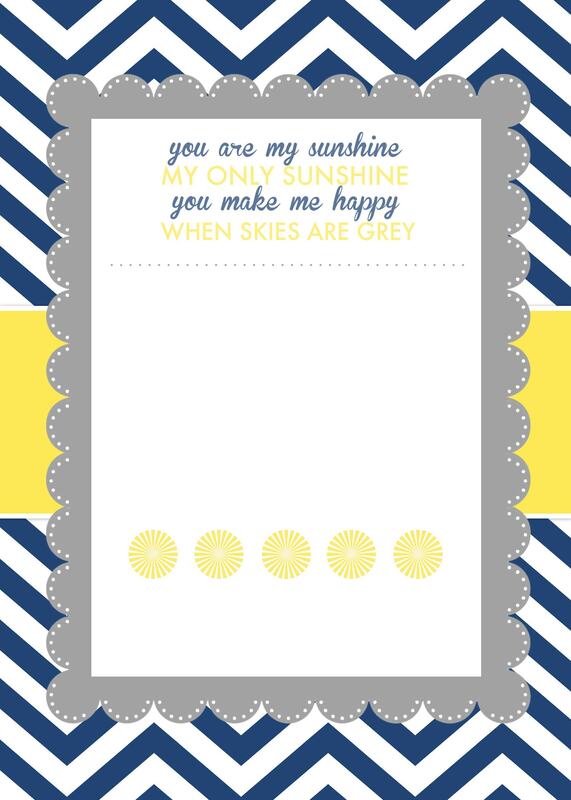 baby shower, birthday party or any other gathering that needs a little sunshine! I just found you when I did a search for summer scavenger hunts for kids and found a 2012 post from you. 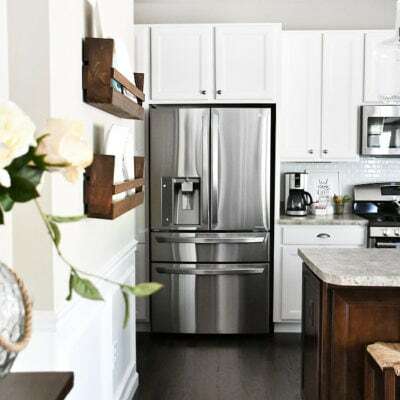 Peeking around your site – looking forward to getting to know you! 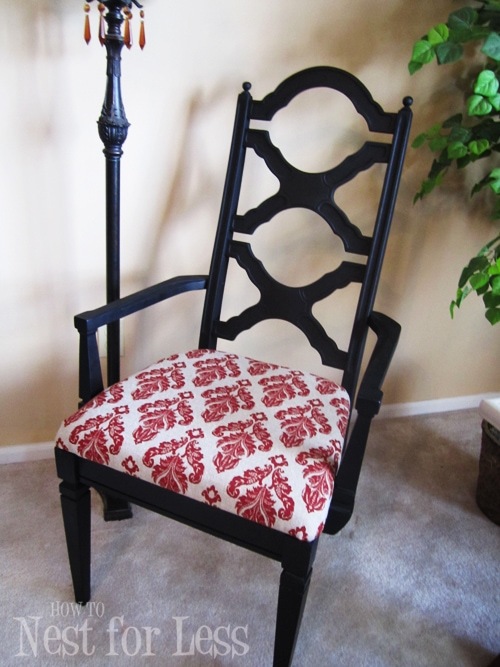 Thanks for your blog and ideas! Thanks so much Lezlee. Glad to have you here! Super cute!! I love it!! Love the colors too!! So adorable, as always 🙂 Thank you!! 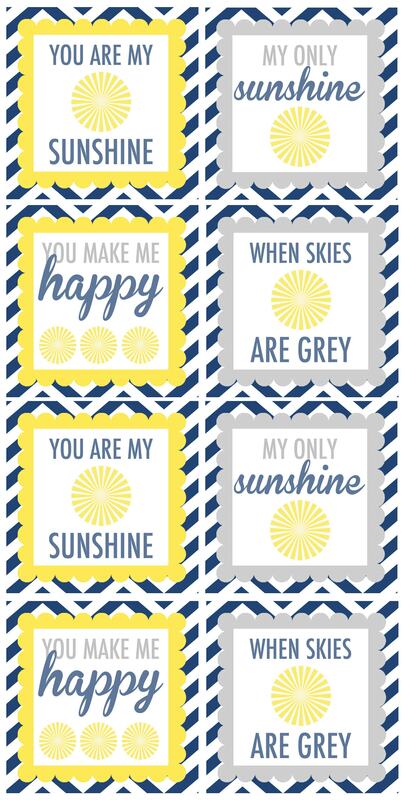 How do I download the navy and yellow you are my sunshine printables? Right click on the file and save it to your desktop. You’ll have to do that to each printable. 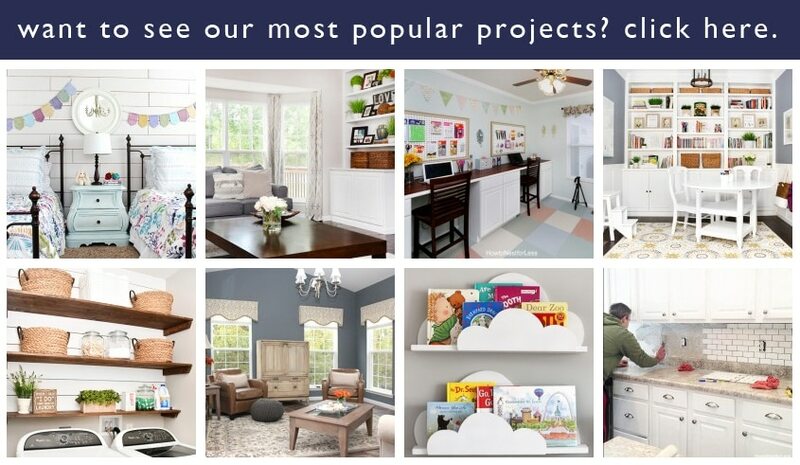 I found you on pinterest– thank you SO much for providing these for FREE! 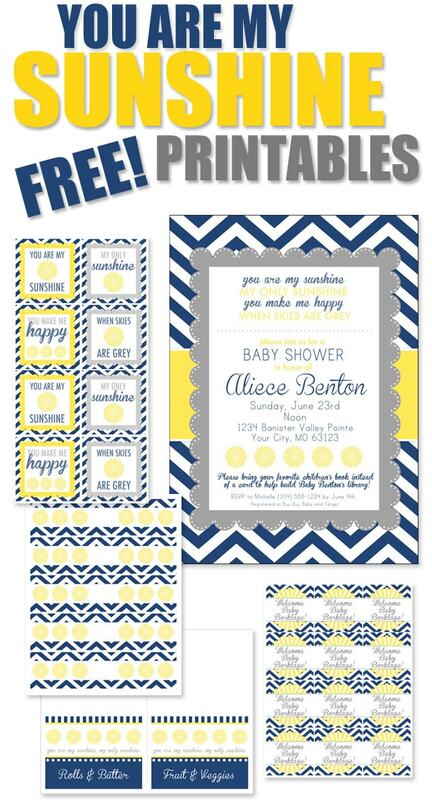 We are planning my son’s first birthday party and these go along perfectly with his theme! 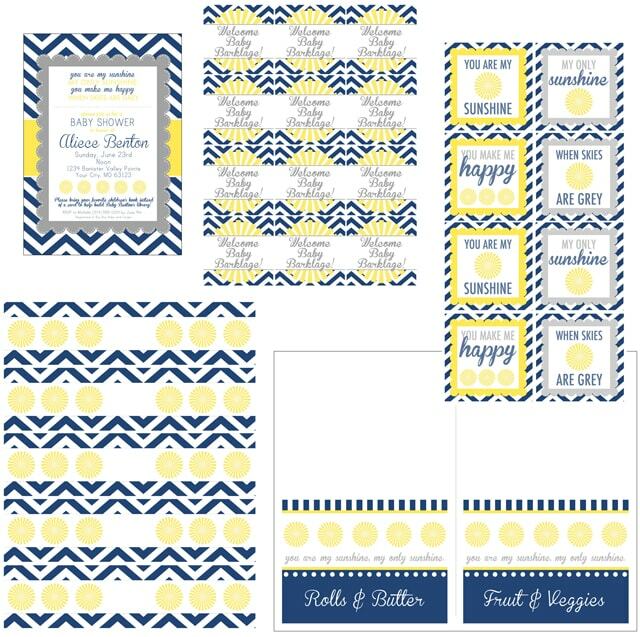 I really, really, REALLY appreciate cute printables that are free instead of $30+ like everything else I’ve found! These are adorable! Oh, one more thing. I am doing a brunch so I love the food table cards. However, I’m a printable beginner– how do you delete your text off the food cards and add my own? You mentioned that you were leaving the printable blank so we could customize our own menu, but I am only seeing one with text already on it and I have no clue how to change the text! Thanks again! I just fixed the image, so sorry! I can’t seem to save file on mac! Love Love Love this. 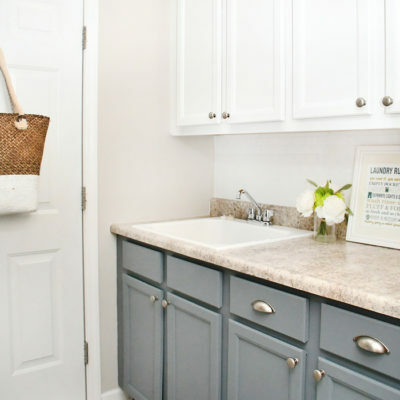 Want to use for my son/fiance’s shower. Right click on the graphics to save to your desktop. They are full sized JPGs! I love the invite, but don’t have a program on my computer to customize them. Are you available to do it for a charge? Please send me an email to discuss! Thank you so much for providing these oustanding printable for free. Do you happen to have these in Microsoft Word?